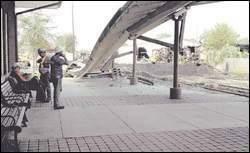 Locals couldn't help but come to the Ocala Train Station on Sunday to see the aftermath of a CSX freight train derailment that left a car garage and an outdoor passenger walkway overhang destroyed. Nine cars of a 71-car train derailed Saturday late afternoon. Mullins Automotive and Truck Center and an outdoor passenger walkway at the station were damaged. CSX investigators were also collecting evidence in hopes of finding a cause.